Here are a couple of questions concerning the images you sent me, let me know if you need any clarifications. It’s difficult knowing where to begin with Apt. 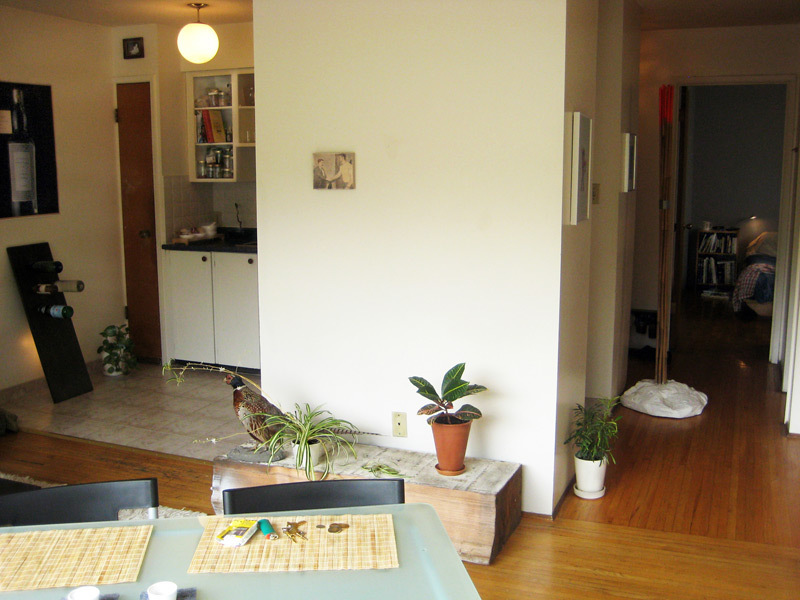 #201 because there are two very different contexts addressed by the work: the gallery and your studio/apartment. 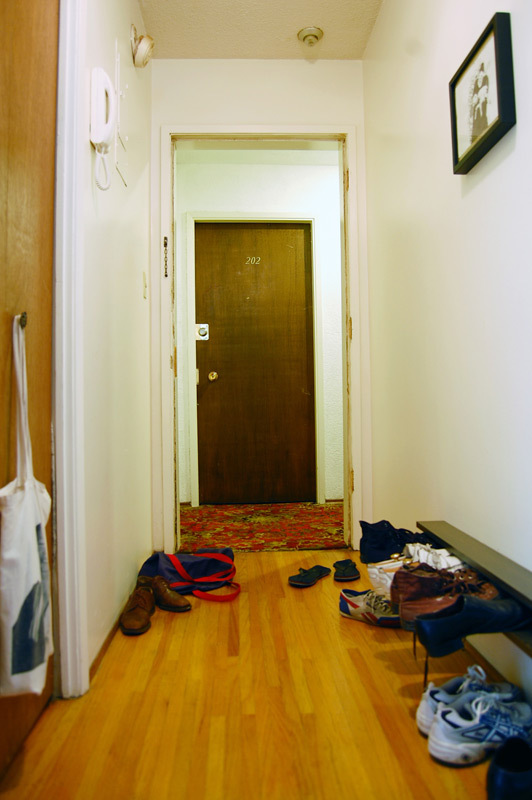 The door is curiously hinged to the white wall of the gallery, which is an ambiguous relationship that I want to address in a moment, but I thought we could begin with the two images you sent of your apartment. I love the way that you framed your neighbour’s door within your own doorless entrance. This photo succeeds in addressing something that seems to be a consistent theme in your work, which is the interaction with strangers. In the past, you have walked strangers home, mimicked their dining rituals, even framed their lost animal advertisements. Could you elaborate on how this work relates to those earlier works? It seems so long ago that I began to work with strangers as a social exploration. I have always liked the idea of collaboration, especially with strangers (sometimes, without them knowing that they were part of the project.) The Dinner With A Stranger project, for instance, was a video work I made for an art class assignment while attending Emily Carr. As I recall, I wanted to make a video work that explored the idea of time and how it exists differently in certain situations. I was thinking of a way to slow time down for myself but not others. 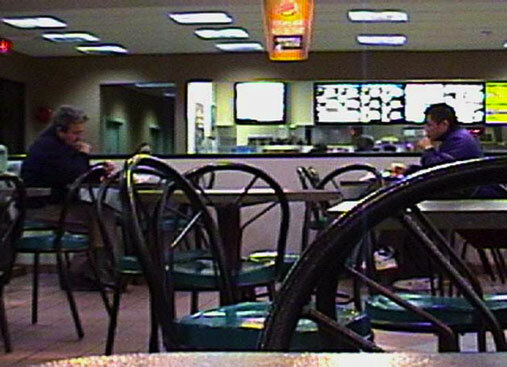 So what I came up with for the project was … I went to a fast food restaurant and ordered the exact same meal as a man sitting directly across from my table. I practically mirrored him to every movement throughout the course of the dinner. It lasted roughly around 22 minutes but it really felt like 3 hours to me during that performance because of the intensity. After that project, I continued to examine the notion of making art with strangers and I went on to produce another project for a photography class. 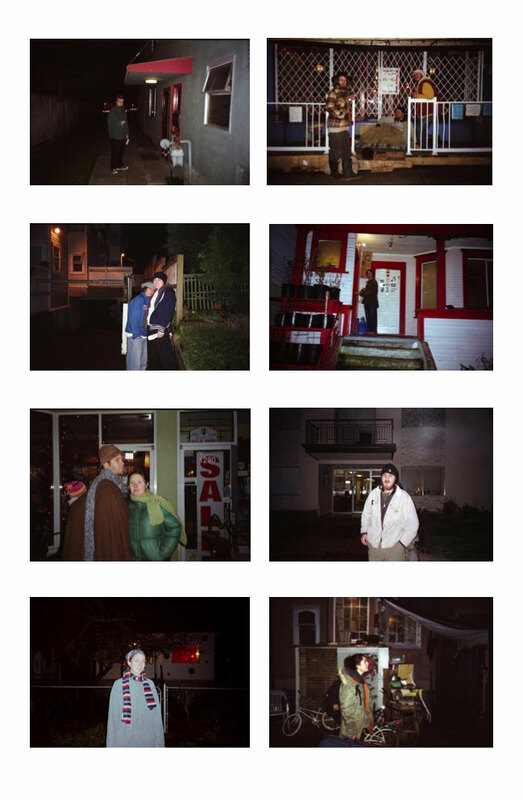 This time the assignment’s subject was “nocturnal” Walking Strangers Home. I approached random strangers wandering on the street late at night in various neighbourhoods around Vancouver and offered to could accompany him or her home. Throughout the evening I couldn’t predict where I would end up depending on the next stranger I ran into. It became a monthslong project and I didn’t know when to stop the project but eventually I had to wrap it up because my class is finishing up. The majority of strangers refused to partake and only small amount of people would agree to participate. With these two projects, documentation became my artwork and left behind were bizarre encounters for the strangers involved in the project. Apartment #201 is my most recent work that also dealt with strangers but this time it took place in my own apartment as well as in the gallery space. 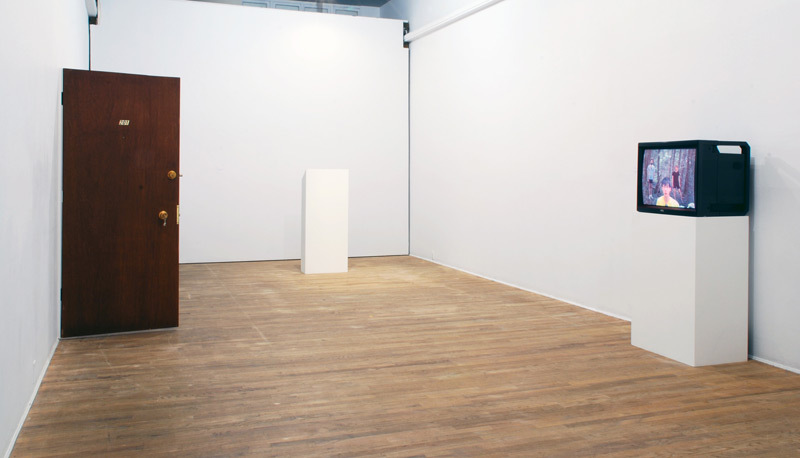 What happened in this project was … I removed my apartment door and mounted it in the middle of the gallery wall as an art object, leaving my own apartment wide open. 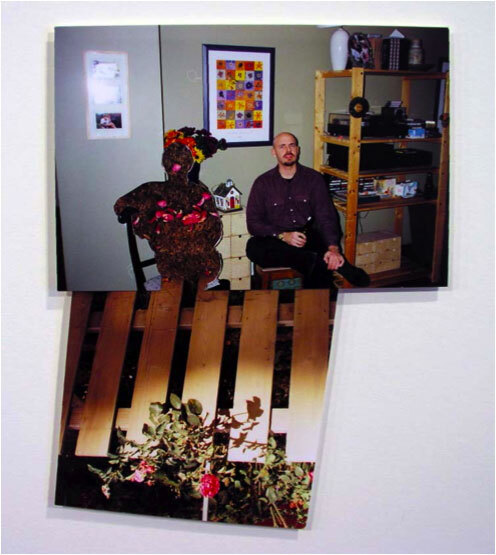 The show was about 5 weeks long and I lived in my apartment without it for duration of the exhibition. With these three particular projects as I just briefly described, I was thinking and still thinking about the space between art and everyday life. Almost all of my work is influenced by what’s around me and the things I see every day. It is an opportunity to explore the behaviour, perception and communication of human beings and an observation of the forms our social exchanges take. I also like the idea of inserting myself into the everyday routine as a performance-based process that remains unnoticed to others. On the other hand, there is the work in the gallery. I’m interested in what this object tells us about its origins and what it does not. 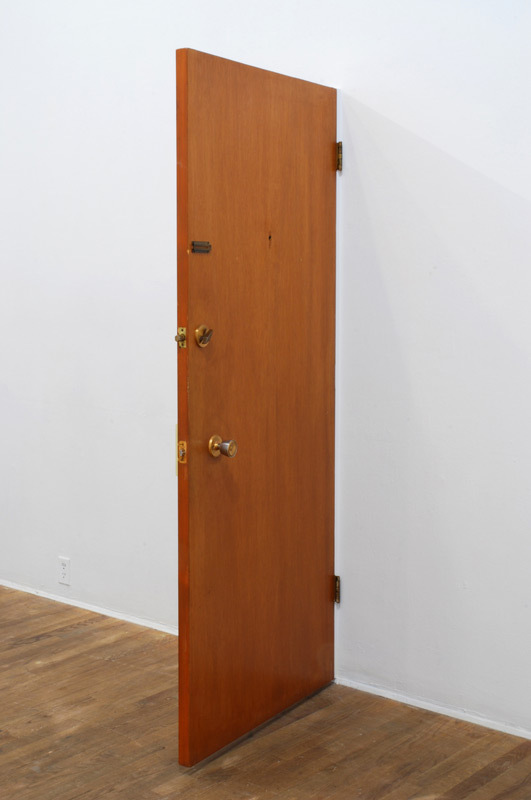 The title of the work tells us nothing more than what we can see from the door — that it is an apartment door (I love that you left the key in — as if you need it!). But it doesn’t tell us what the photos you provided tell us, and I think that’s very interesting. It is an ambiguous object, unmoored from its context at your (now doorless) apartment. 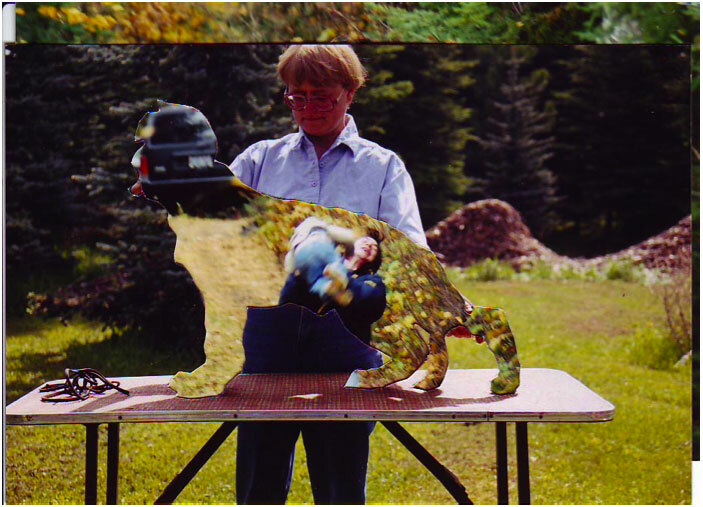 I’m reminded of another body of work, where you have used family snapshots, shifting the personal nature of the photographs through montage, and then presenting them as artworks completely removed from the domestic context. Considered in this way, how do you see the door functioning within the context of the white cube? I found it challenging when I thought of the project at first, I wasn’t quite sure how to present it. If I were to mount it in the gallery attached in a doorway it would change the meaning of the work completely. It would be part of the building and it would become more of a site-specific project. I wanted to treat it as an active sculptural object instead so I decided to mount the door vertically in the centre of the gallery. 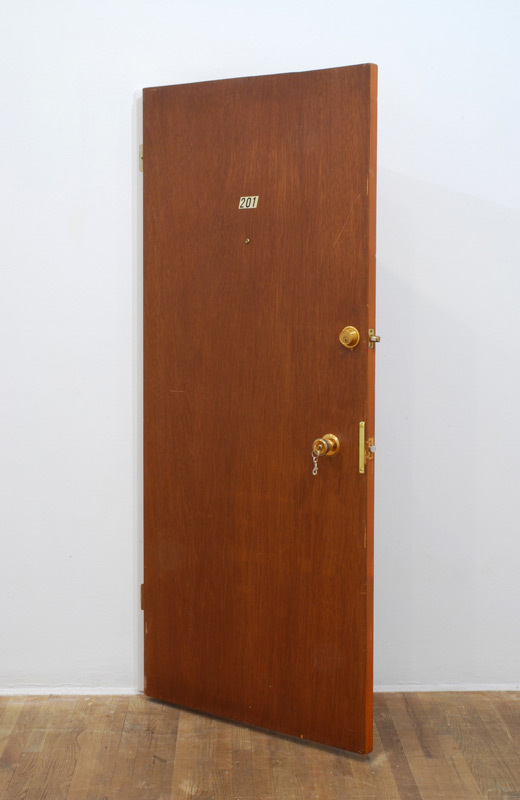 With this door project, I wanted to present a ready-made object as artwork which has a minimalist approach at the same time to problematise the art object by activating my apartment as an extension of the work in the white cube. Although I removed the functionality of this door by placing it in the white cube my life is still depending on it. The whole time I was waiting for it to return to its original location to serve the purpose of what it was made for, which is to protect myself and my belongings. As far as an art object goes, it is completely worthless because I eventually destroyed it by putting it back to my apartment and continuing to use it again. The door displayed in the white cube is a mundane object that has implications for my life, which is widely exposed to everyone that lives in the building and their visitors. This is much similar to my most current project that I’m working on at this moment where I’m using my family photographs combined with found and donated photos from friends to make collages. I’m bridging my personal life with others to see what comes out of two unfamiliar worlds.